Who is the Most Handsome Man in the World 2019? This list is composed of famous living men from Tv, movies, sports, politics or models. 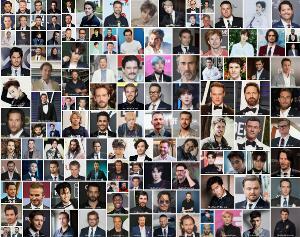 We choose the most Handsome Men in the World 2019 according to your votes. Choose your favourite one and vote for him. If your favourite man is not take place in our list, we can add him according to your comments above our post. You can vote only once in 24 hours. Who is your favorite actor? Sam Heughan or Aidan Turner? Who is your favorite actor? Tom Ellis vs Dan Stevens? Who is your favorite actor? Tom Hiddleston vs Gerard Butler? Falta el incomparable actor turco CAGATAY ULUSOY.Por favor.esat en segunada temporadaThe El Protector. Could you add Bob Morley from The100 please? Vote for BamBam GOT7.Thank you. Baris Arduc is added. Page #1. Thanks for your comment. Please add Bob Morley from The 100 to this poll. Thank you!!! Please add Bob Morley. Thank you. Enrique Iglesias is added. Page #2. Thanks for your comment. VOTE FOR SAM HEUGHAN! POLL SHUTTING ME OUT! PLEASE HELP! Only one CAN YAMAN !